Another busy harvest is complete. After a good start on a full moisture profile, it turned into a difficult season with less than 25 mm of useful “in-crop” rain. With good yields under very dry conditions, the benefits of zero-till farming shine out. As for yields, wheat averaged 2.5 tons/ha with good protein, barley malted at 2.5 tons and faba beans at 1.8 tons. 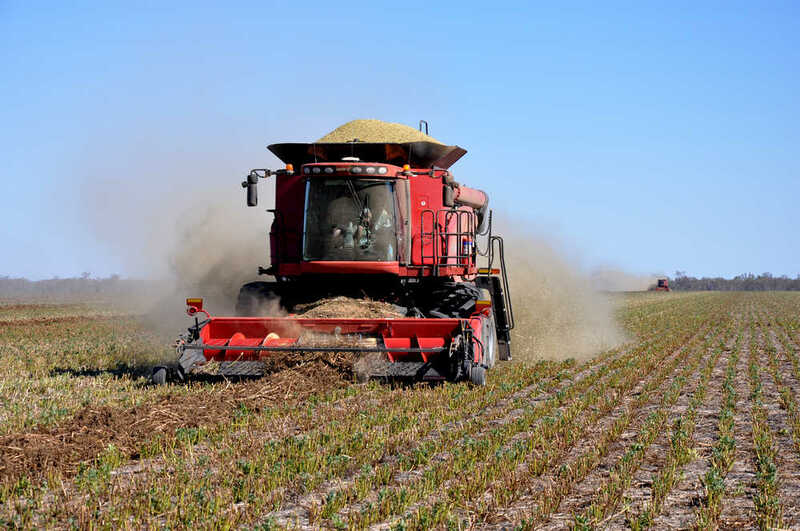 Canola was badly damaged by wind in the week or so between swathing and harvest with many windrows blowing up to 9 metres to the next row – 1 ton/ha was dissapointing. Chickpeas at 1.8 ton/ha were a good result given their high $ value. Many thanks to everyone who helped, including Jock, Jungle Jim, Rex, Jimmy Chappo, PJ, Orchy, Tarvi and Andre, Vincent and Bill, and a big thanks again to Andrew and his crew from TBO harvesting. Also thanks to the women folk who were either busy behind the scenes or put up without their men for a month or more. We hope to see you back next season for another big harvest. Merry Christmas and best wishes for 2010. Really liked the site. I recall having seen it before so must have already visited. Will be in contact.